Think of this as Chinese congee that is made with oatmeal, or a bowl of oatmeal made with savory ingredients. Compared to rice, oatmeal is more healthy and can be cooked faster. This is a favorite of mine mainly due to its simplicity, the speed that it can be made (therefore not requiring much planning) and I can put everything that I like in one pot. 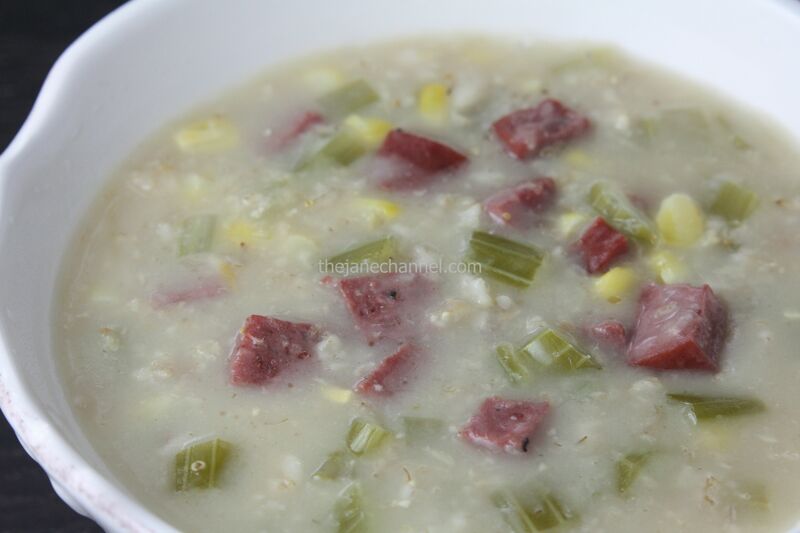 Place chicken stock, celery, corn kernels and oats in a pot and bring to a boil, then reduce heat and allow to cook until desired consistency is reached, stirring occasionally. (I cooked for 13 minutes for a creamier texture). Stir in sausage and cook for a minute. Salt and pepper to taste. That almost looked like congee.